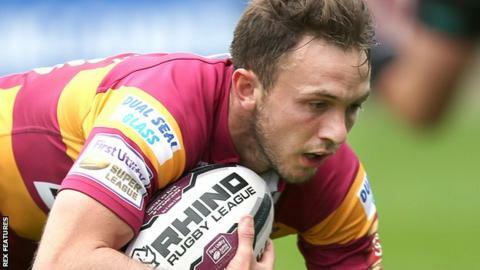 Huddersfield Giants scored 11 tries in a 58-28 victory over Batley Bulldogs. Ryan Brierley scored a hat-trick, while Leroy Cudjoe and Tom Symonds crossed twice as the Giants went third in the Qualifiers table with their second win. Gene Ormsby, Eorl Crabtree, Jake Connor and Joe Wardle also touched down in a convincing Huddersfield victory. Shaun Squires and Dave Scott scored two tries apiece for the hosts, who trailed 48-2 at half-time and have conceded 192 points in their three Qualifiers games. Batley: Scott; Reittie, Squires, Ulugia, A Brown; Walker, Brambani; Hirst, Leak, Rowe, Day, Bretherton, J Brown. Replacements: Davey, Lillycrop, Gledhill, Harrison. Huddersfield: Connor; Murphy, Cudjoe, Wardle, Ormsby; Brierley, Ellis; Crabtree, Hinchcliffe, Huby, Symonds, Lawrence, Ta'ai. Replacements: Wood, Roberts, Ikahihifo, Rapira.